Have I got a great site for you to check out! Liz from Hometalk recently asked me to curate a clipboard on Fabric Christmas Trees. She was smitten with the Christmas Chalkboard Fabric Tree I did for my kitchen and thought I would love to put a board together featuring fabric Christmas tree ideas. Who wouldn't want to do that? I am so honored! I had lots of fun clipping away on Hometalk! And my board really turned out adorable . 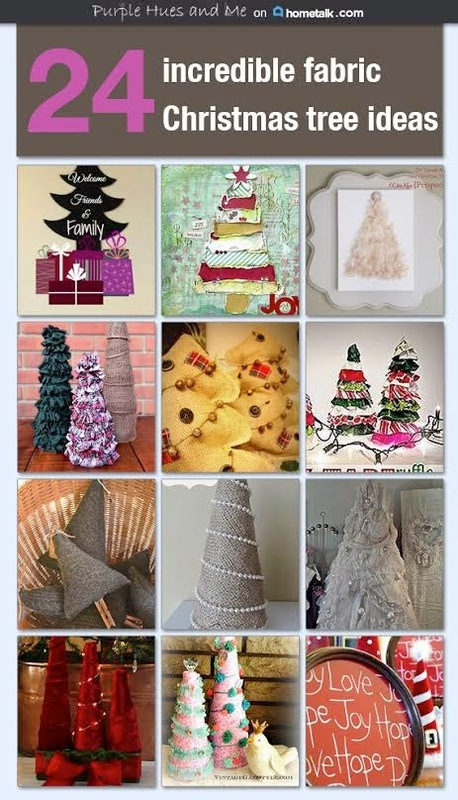 . . you'll find among them fabric Christmas trees made out of mixed media canvas, lace trees, grain sack trees, plaid fabric trees, duct tape trees, elegant velvet trees and there's even a 7 foot tree made out of vintage wedding gowns. How cool is that! I love Hometalk! It allows us, the DIY/Home Craft community, to share projects and ideas . . . and it's very interactive, giving us the opportunity to ask questions and give answers. So hurry on over to Hometalk by clicking the graphic or check out my clipboard here and if you haven't already, sign up and start clipping away!!! I love Hometalk! Heading over there right now to follow you there too. Gotta check out all your trees....tis the season. What a great board Gail. I see a lot of fabulous fabric tree inspiration. Love Hometalk! Love Hometalk too. It's also a great place to share for people that do not have a blog. Headed over to see your board! Beautiful off to see your board.